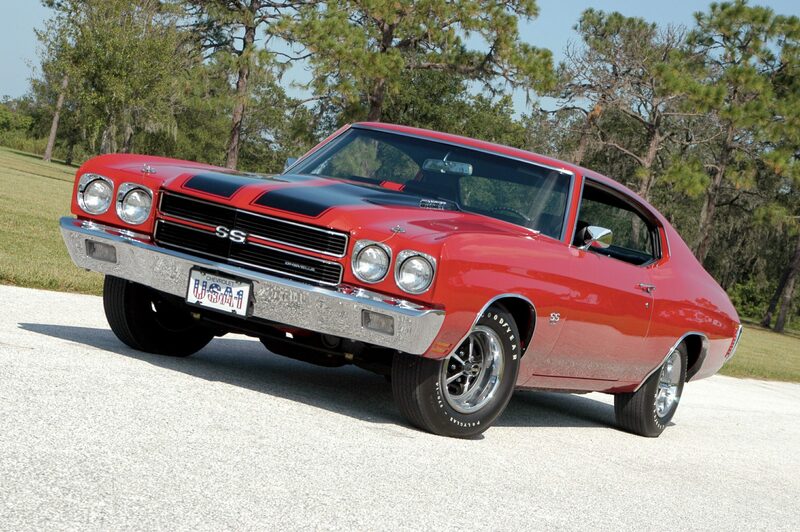 The 1970 LS6 SS454 Chevelle rode on a 112-inch wheelbase. With its wider track and big Polyglas tires, the SS454 could handle almost as well as it could accelerate. In the hierarchy of the street, circa 1970, there were the Big Dogs and then there was everyone else. Having 400 cubic inches under the hood didn’t cut it anymore at the Stoplight Grand Prix. The name of the game was horsepower and the more grunt the better, and more grunt meant more cubic inches and more horsepower. 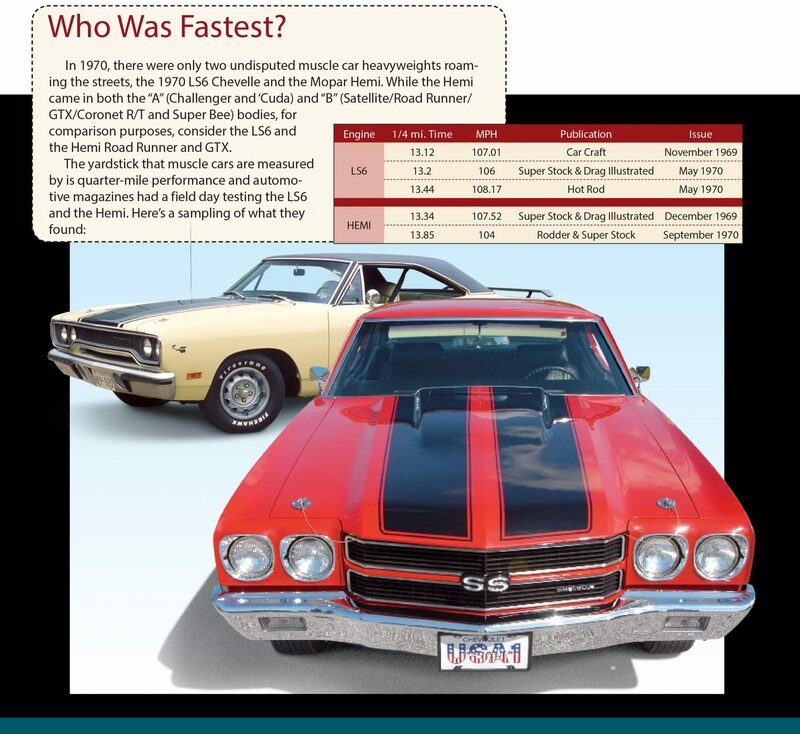 The old standard “there’s no replacement for displacement” was never truer in 1970, and sitting atop the muscle car food chain was Chevrolet’s SS Chevelle. Not just the garden variety, 360 horsepower SS454, but the King Kong of the Bow Tie brigade, designated RPO Z15. Checking off this option delivered a 450 horsepower, 454 cubic inch solid lifter behemoth that cranked out 500 lbs.-ft. of torque and bludgeoned any challengers for its title as King of the Streets. While the cars were tested with either four-speed or automatic transmissions, they did display similar times. Removal of smog equipment and installation of headers and some timing adjustments produced times far quicker on the street. Both were capable of laying waste to lesser muscle cars, and the winner of a brawl between these two engines was dependent on driver ability. Chevrolet was caught flat-footed when the muscle car market took off in 1964. The Pontiac had set the standard by dropping in a 389 cubic inch Bonneville engine in the intermediate sized LeMans, however, the largest engine Chevrolet offered for their new Malibu was 327 cubic inches. The big block Chevelle first appeared in 1965 as the “Z16,” a 396 cubic inch, 375-horsepower model that was limited to just 201 produced. 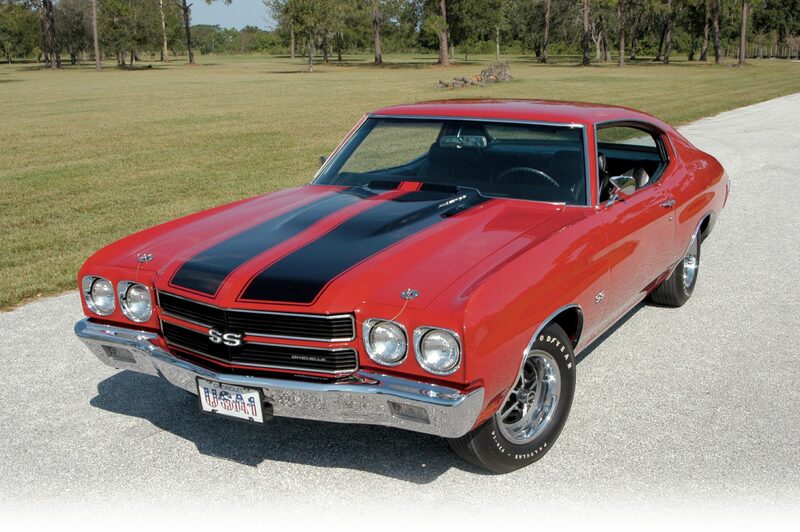 In 1966, the SS396 became an option on the Chevelle to challenge the GTO, selling 72,272 units to Pontiac’s 96,946. The SS396 would continue through 1969 with the 396 engine as the only power plant, offered with one of three horsepower packages—standard 325 or optional 350 or 375 horsepower. 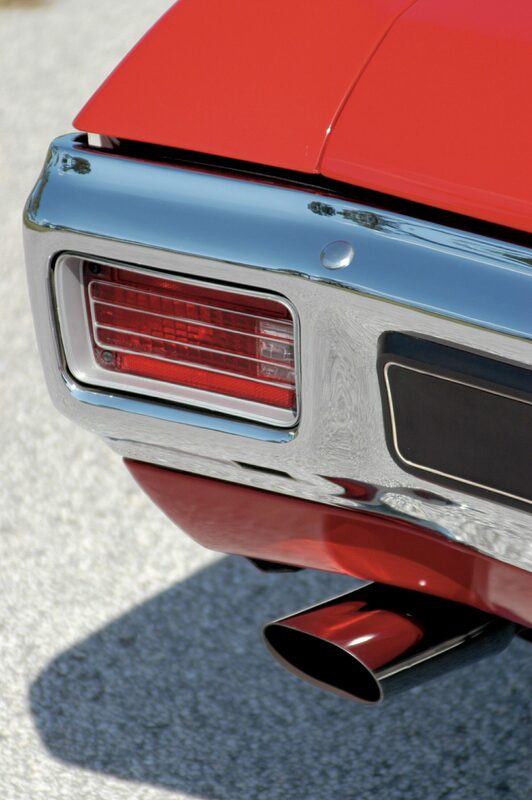 For its 1970 models, GM lifted the 400 cubic inch ceiling on intermediates, and the four divisions producing muscle cars immediately dropped in their largest engines. Buick, Oldsmobile and Pontiac picked their 455 engines off the shelf, while Chevrolet chose to punch out the venerable 427 to 454 cubic inches and offered the hydraulic lifter LS5 rated at 360 horsepower and the solid lifter LS6. 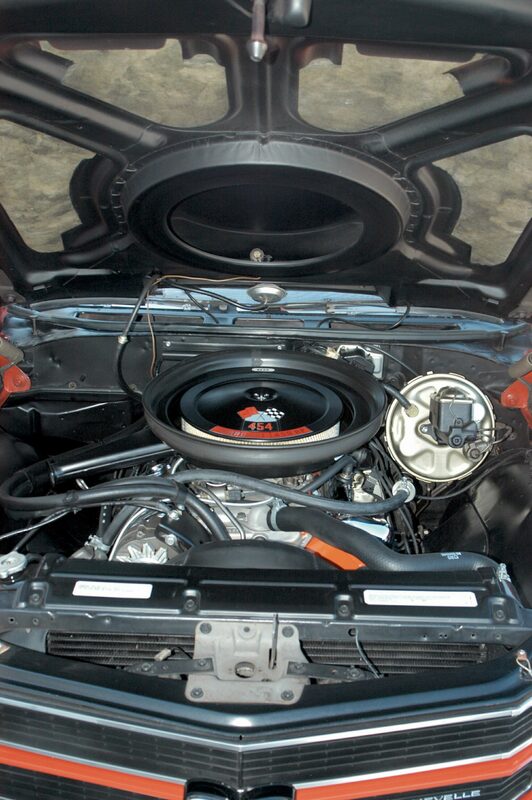 The 450 horsepower LS6 was the most powerful engine offered in 1970. The Cowl Induction system fed cold outside air to the big 780 cfm Holley carburetor. The LS6 used the same block as the LS5, however a 800-cfm Holley four barrel bolted to an aluminum manifold replaced the Rochester Quadra Jet. The LS6 featured a beefy bottom end with four-bolt mains, forged steel crankshaft and connecting rods with forged aluminum, 11.25:1 compression pistons. Because of the LS6’s high (6500) redline, deep groove accessory drive pulleys were necessary. Thanks to new Federal emission standards, the LS6 was hobbled with the primitive Air Injection Reactor (A.I.R.) pump plumbed into the tops of the exhaust manifolds that injected additional air into the exhaust system. By doing so, it reduced the products of incomplete combustion (hydrocarbons and carbon monoxide) and further combustion occurred in the manifold and exhaust pipe in the presence of this oxygen-laden air. Only the Holley-equipped LS6 received the A.I.R. system, which was one of the first items removed by owners on taking delivery from the dealer. Either the Muncie M22 “Rock Crusher” close ratio four-speed manual transmission or the three-speed M40 Turbo Hydra-Matic automatic were available with rear gear choices up to 4.33:1 rear gears and limited slip differential. Buying an LS6 Chevelle required the customer to purchase mandatory options, and it wasn’t cheap. The $503.45 RPO Z15 SS 454 package consisted of bright engine accents, dual exhaust with bright tips, black painted grille, wheel opening moldings, power front disc brakes, special rear suspension and F70 x 14 tires on 7-inch rims. The rear bumper had a black insert while up front the SS got a “power bulge” hood. Also part of the package was the base 360 horse LS5 with heavy-duty battery. From there the buyer selected the RPO LS6 454 engine that cost an additional $263.30 and either a M22 ($221.80) or M40 ($290.40) to add to the bottom line. Just to get the Bow Tie’s biggest bruiser cost at least an additional $988.55 to a base price of just over $2,800. By the time other options were added, the SS 454 Chevelle could cost well over Four Large. The SS Chevelle borrowed the handsome instrument panel from the Monte Carlo. Buckets, console and sport wheel were optional. 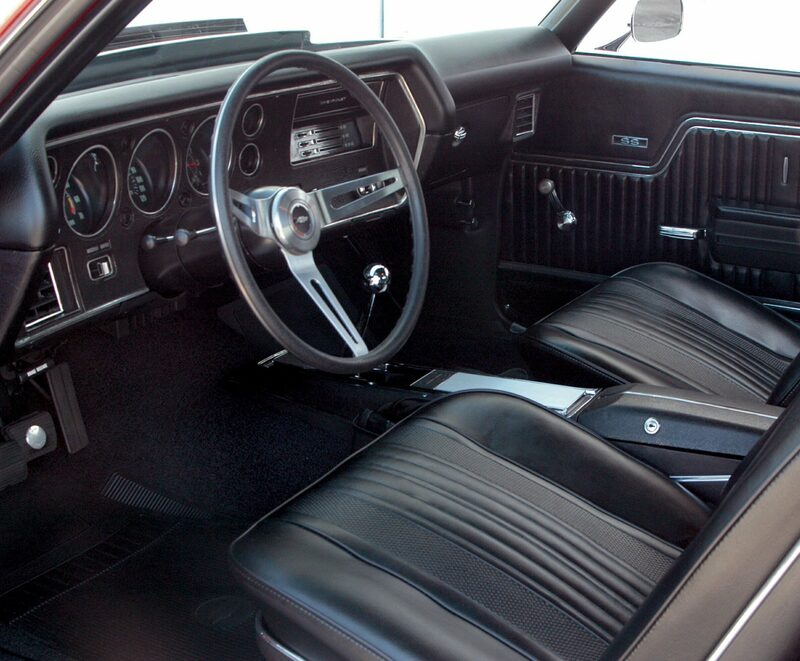 The standard interior featured a bench seat regardless of transmission. When the optional bucket seats were ordered, a center console was also available. Unlike most carmakers that would use the same basic dash layout in all series models, the 1970 SS Chevelle received a different instrument panel setup than the base Chevelle or Malibu models. Borrowed directly from the new Monte Carlo, the large, flat-faced panel housed the gauge package, which featured three large circular gauges for the tach, speedometer and clock with smaller gauges flanking them. To the right was the HVAC controls, radio and lighter. The exterior of the SS 454 Chevelle featured sculptured lines above the wheel openings that pulled the car’s look downward. The blacked out grille was split horizontally and dominated by a large SS emblem in the center. 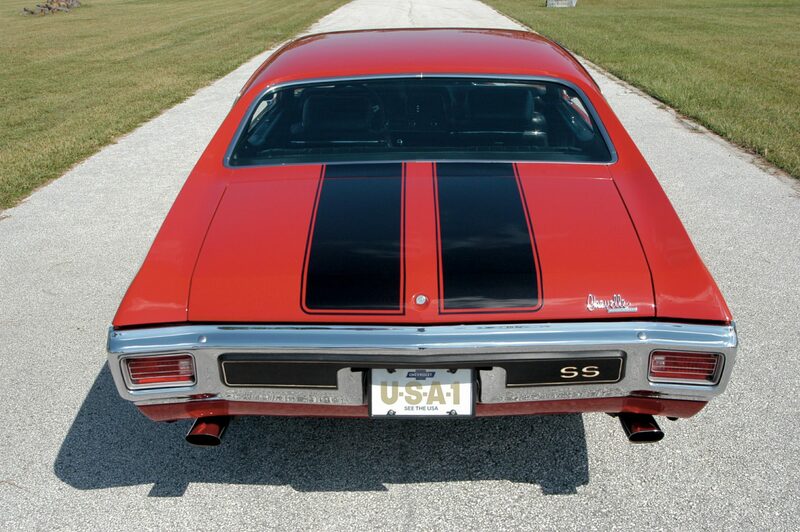 Chevrolet offered wide “Stereo Stripes” that ran the length of the hood and deck lid and included Cowl Induction, which featured a vacuum-operated door at the rear of the SS hood. It fed air from the high-pressure area at the base of the windshield to the big Holley carb. 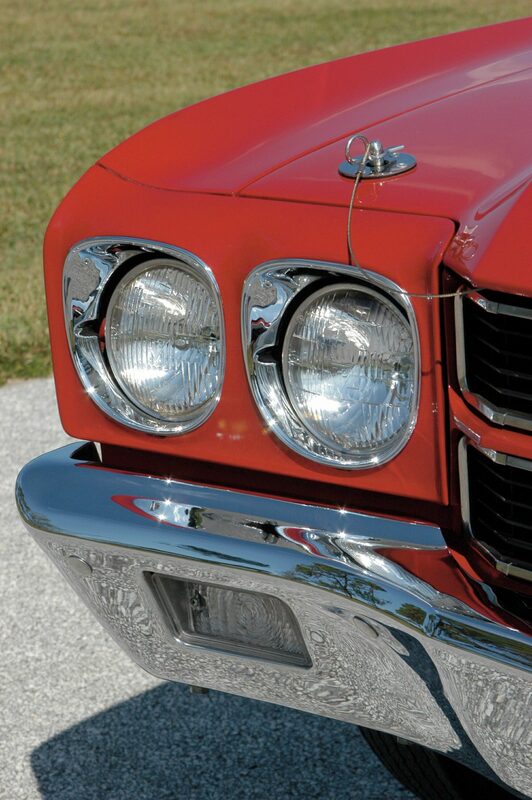 Dual Guide T-3 headlamps were surrounded by chrome bezels. Chrome extensions tipped the LS6’s rumbling dual exhausts. While build out documentation is spotty, it’s agreed that Chevrolet produced 4,475 LS6 Chevelles, however there is no break down to separate coupe, convertible and El Caminos in that total. One of those coupes was this Cranberry Red version owned by Rob Timken of Clearwater, Florida. Built in Arlington Texas, the LS6 spent most of its very pampered life in Florida. In November 1992, Rob spotted the car in a hotel parking lot during a car show and when he discovered the owner wanted to sell it, Rob quickly struck the deal. He was thoroughly impressed with the cars originality, options and low miles, and felt it would be the perfect “fun car” to drive. Although the 66,000-mile LS6 was in virtually pristine condition, the perfectionist in Rob just couldn’t resist doing some rebuilding and detailing. “I spent time over the years,” Rob told us, “painting and detailing the car and rebuilding the engine.” He gave the LS6 a 0.30 cleanup bore, keeping the stock compression and using all original parts. Before dropping it back into the car, Rob had the engine dyno tested, recording 485 horsepower and 513 lb.-ft. of torque. The interior received new upholstery and carpeting, along with an NOS center console plate and sport steering wheel. The option sheet includes tilt column, power steering and brakes, door edge guards, Rally gauge cluster, cowl induction hood and stripes, bucket seats, console and AM radio. In the 13 years Rob’s owned the LS6, he’s put just over 1,800 miles on the odometer. While he doesn’t drive if often, when he does he savors the tremendous torque of the LS6 and the instant acceleration that only the King of the Streets could deliver. 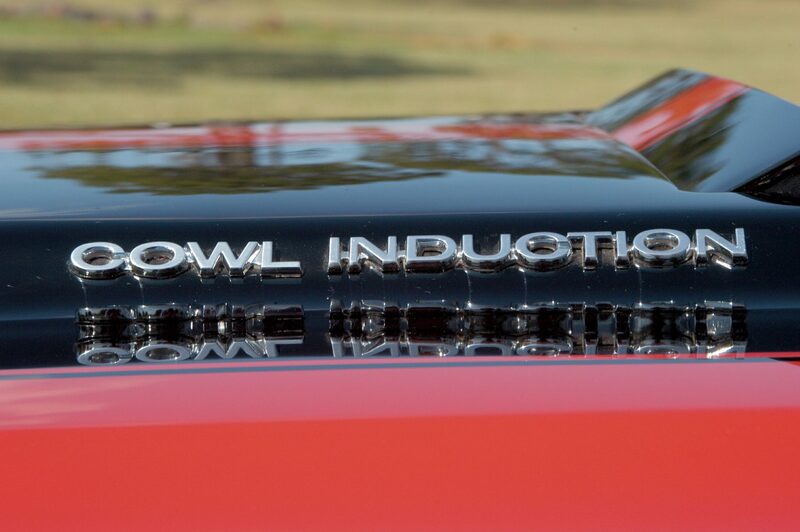 Hood pins, Cowl Induction hood, SS454 emblems and “Stereo Stripes” were all part of the SS Chevelle’s muscular appearance. 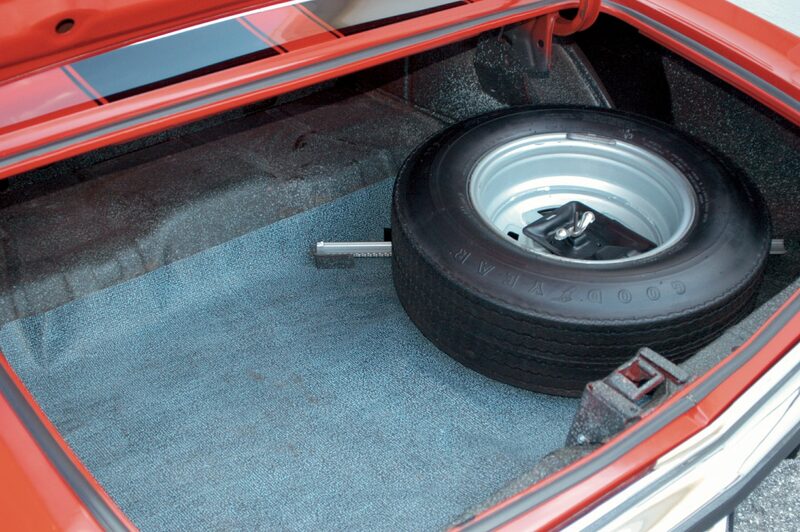 The spare tire consumes much of the trunk space, however there’s room for a floor jack, tools and jack stands when it was time to head for the drag strip. Do you own a collector car? If so, give us a call or fill out our simple get-a-quote form.